I understand this is a download only product. 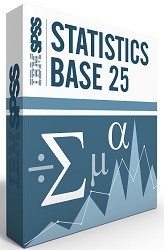 IBM SPSS Statistics Base is easy to use and forms the foundation for many types of statistical analyses. 10.10: You must download a Java 6 or 7 installer from Apple and install it before installing the software. Adds a Casio PRIZM fx-CG500 Graphing Calculator at a Special Price!